The Grey Wolf is known as the Timber Wolf in North America and the White Wolf in the Arctic, or more generally as the Common Wolf. Wolves are legendary because of their spine-tingling howl, which they use to communicate. A lone wolf howls to attract the attention of his pack, while communal howls may send territorial messages from one pack to another. Some howls are confrontational. Calls may be answered by rival packs. Much like barking domestic dogs, wolves may simply begin howling because a nearby wolf has already begun. There are many subspecies of wolf including the Arctic wolf, all of which use a variety of howls to communicate to one another. They have a highly organised social structure enabling them to enjoy maximum cooperation when hunting, communicating and defending territory. Wolves live and hunt in packs. They are known to roam large distances – as much as 20km in a single day. Wolf packs in the far North often travel hundreds of kilometres each year as they follow migrating herds. Wolves are highly territorial animals, and generally establish territories far larger than they require to survive; in order to assure a steady supply of prey. Territory size depends largely on the amount of prey available: in areas with an abundance of prey, the territories of resident wolf packs are smaller. These social animals cooperate on their preferred prey. A single wolf is capable of catching and killing a deer unaided, but when hunting as a pack they prey on much larger animals, including deer, elk, and moose. Wolves also eat smaller mammals such as birds, fish, lizards, snakes, but also eat fruit. When they get a successful kill, wolves do not eat in moderation. A single wolf can consume 9 kg of meat in one sitting! The highest ranking wolf will eat first and what cannot be consumed is left for the scavengers, even though they may have to wait another three days for their next meal. Wolves are not particularly fast, with a top speed of about 45km/h (28mph). They instead rely on their hearing and sense of smell to detect prey. They have remarkable powers of endurance and are known to follow their target all day and night if necessary. Wolf packs are established according to a strict hierarchy, with a dominant alpha male at the top and an alpha female not far behind. Usually this male and female are the only animals of the pack to breed. Packs consist of between five and ten animals – usually offspring from several years. All of a pack’s adults help to care for young pups by bringing them food and watching them while others hunt. The hierarchy that exists within each pack is maintained by dominant or submissive body posturing, and by other behaviour patterns such as the communal care of the young. Wolves feed their young by carrying chewed-up food in their stomachs and throwing up, or “regurgitating”, the food for the pups when they come back to the den. Wolves have only one breeding season per year – in the winter. They have their puppies in late April or early May. They have their puppies in an underground hole, or den. There are usually four to six puppies in a litter. The puppies grow up fast and are their adult size by the end of their first winter. They are grown up by the time they are two years old. Once widespread throughout North America, Europe and the Far East, the grey wolf is, sadly, now only found in large numbers in specific parts of the USSR, North America and Eastern Europe. 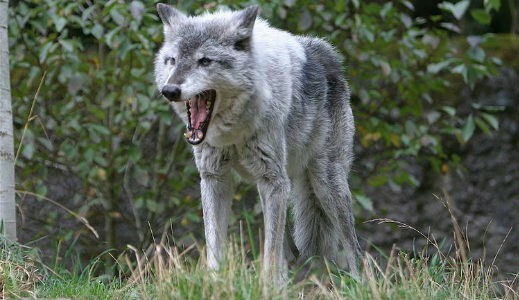 The grey wolf has always been feared by man and has probably been persecuted more than any other animal. Did you know that centuries ago, wolves were ‘tried’ by people and burnt at the stake? However its intelligence and flexibility have saved it from extinction. Another reason for their decline has been the dramatic reduction of their natural prey. This has largely been replaced by farm stock which is protected by the use of poison, traps and guns. The final fate of wolves will depend on whether man is prepared to coexist with them. Range: northern United States, Canada, and Alaska, with some scattered populations left in Europe and some reintroduced populations in the American southwest and, notably, in Yellowstone National Park.